There is no doubt in my mind that the putter is quite simply the most personal club in the bag. Being an unabashed addict of all things putter, I’m not afraid to admit I got excited when the Gauge G2 “Little Dog” and the Whitlam 8802 came into my hands for my first official THP review. With such a personal club, it’s no wonder there are so many different options out there for golfers, ranging from OEM lines all the way into the realm of the ever-growing boutique versions. Whitlam Putters and Gauge Designs is a brand that I had heard of and always kept an eye on, but never had the chance to try out. While they most certainly are not a household name, they are a brand that takes pride in not only producing the best possible milled putters they can, but also on pushing the boundaries of design as they go. The focus of this review will be on the performance and design of the Gauge G2 “Little Dog” with an additional look at the example of what custom work can be done with the Whitlam 8802. 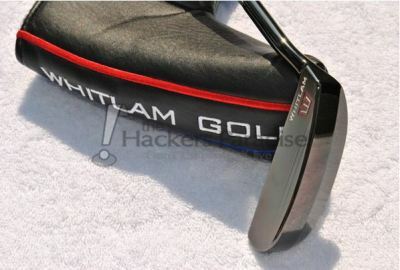 Generally speaking, the Whitlam and the Gauge putter lines bring with them two different thoughts to the putter table. With the Whitlam line, you see incredibly unique and different putters, including some annual designs and “collector’s series” putters, while you see a more traditional approach with the Gauge line. Both lines together run the gamut of putter design. There is a variety of necks/shafting available and the two lines provide unique takes on traditional looks, while also bringing to the table some truly different styling on mallets, as well as testing the waters of moveable weights and inserts. Another area the Gauge/Whitlam line has not been afraid to dip their toes into are finishes as outside of the typical satin and black PVD looks. They have even done red on some designs. There is little doubt to me that very few, if any, other putter designers or companies hit as many different types and styling of the putter as Gauge/Whitlam does. The Gauge G2 “Little Dog” is a full toe-hang #9 style putter accompanied by a singular site-line. 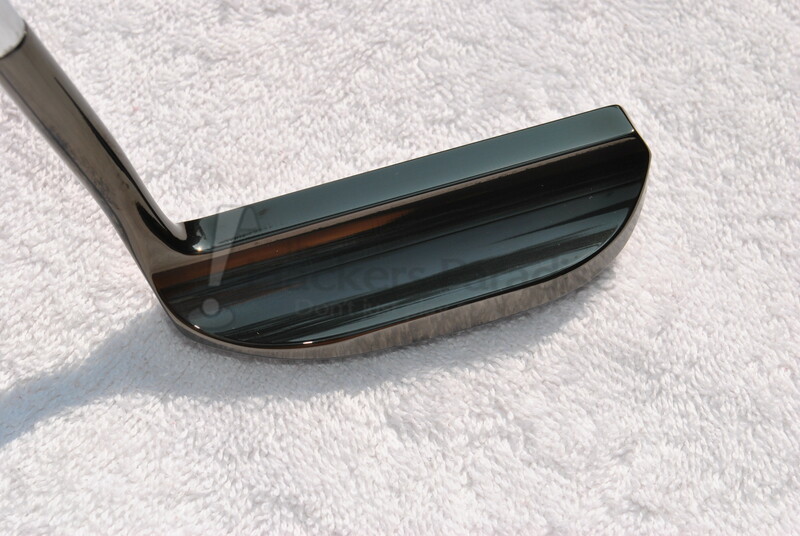 This putter is made of 303 Stainless Steel with a 360g head weight and is finished in a piano black PVD finish. The putter is paired with a nicely-done “Calipers” Velcro head cover as well as a Gauge Ion black putter grip. Obviously, the first look at the “Little Dog” putter brings with it a collective, huh? The first thing one notices is the traditional #9 look to the overall shape and neck, but then they eyes cannot help but lock on the unique cutout in the back of the flange. 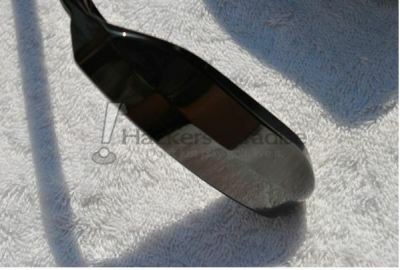 Half-moon cut outs are not a new occurrence in the putter world and are quite popular at the moment, but on an enduring design like the #9, it gives a whole new twist. In combination with the cutout, the topline is slightly thicker/more square to my eye than I have seen on most designs of this basic head shape. I think there is purpose to that, but I will touch on it in a bit. As stated earlier, the finish on this one is a “piano black” style PVD finish. I love PVD for its durability, so that is always a big bonus in my eyes. I’ve seen a lot of different PVD’s over the years and some have been better quality than others. The finish on the Gauge “Little Dog” is spot-on; not only giving it that glass-like black look, but even capturing some of the PVD rainbow colors in the cavity as well. It’s a very well done finish. 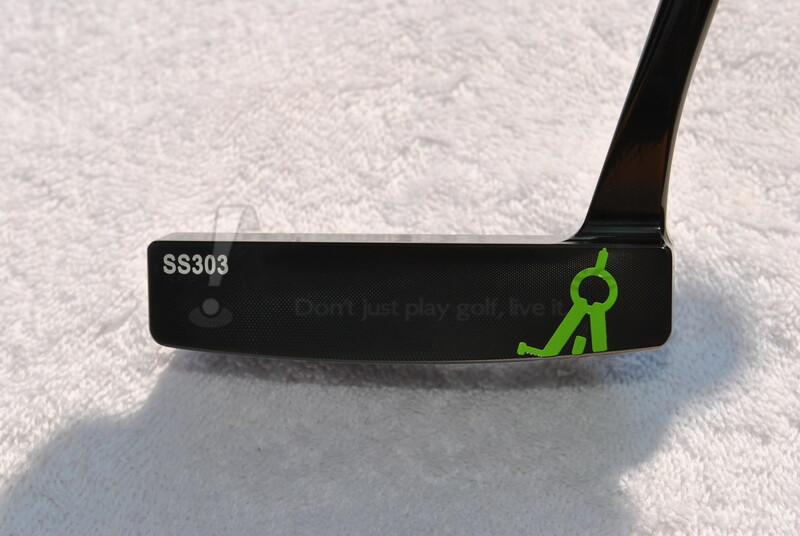 The putter features a fair amount of engraving as well. Most noticeable is an overlapping Gauge “Calipers” logo that actually wraps from the face and onto the sole. 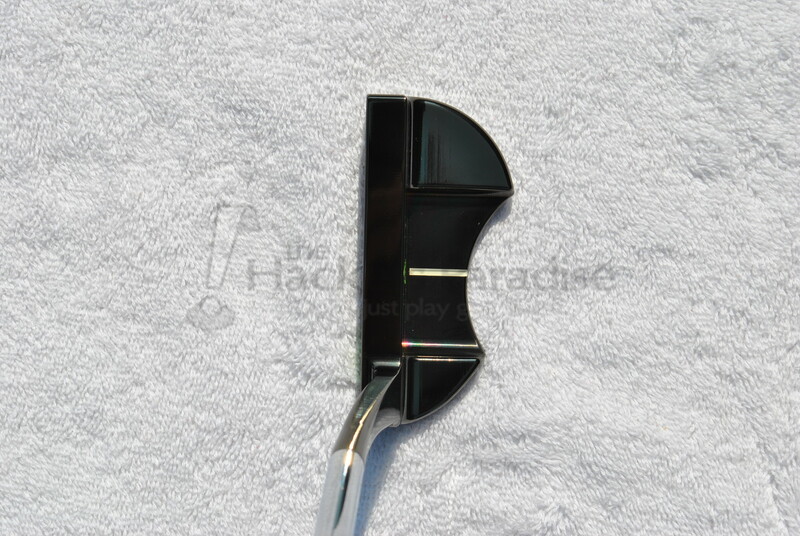 The same logo is featured in the cavity of the putter as well. I particularly like the pair of calipers. To me, it is a unique logo that catches the eyes. One portion of the stamping that I’m not quite as fond of is the text on the toe and the sole. It is not that they are poorly done, but in my mind, it simply takes a bit away from the overall look and flow of the design. The “SS303” engraving on the toe is a bit distracting from the overall look and the text on the sole is not so much distracting as it is just a bit busy. Whether or not the text truly takes away from the design is obviously going to vary with each individual’s personal eye and, again, that is the beauty of putters. To the point, the “Little Dog” for me is a lot of fun to putt with. The combination of the half-moon style cutout blends very well with the simple, single site line on the head itself. I typically struggle with a #9 style as far as aim is concerned, but that was not a major issue for me with this particular take. Additionally, the slightly wider top line really aided me in making sure I was square at setup and on my line. It also became evident to me that the topline really seems to help maintain the balance of the putter with the mass that was lost from the half moon cut-out. I was concerned coming in that the cutout would throw off the balance in a putter style that is already toe weighted. I was very pleased to see that its performance/feel in the stroke did not suffer at all and instead flows through just as one would anticipate any regular #9 putter to perform. Now, on the topic of feel (sound), the “Little Dog” surprised me quite a bit here. Typically with a putter made of 303 SS you will get a much more audible “click” with the ball off the face that makes the user interpret the putter as being harder or more firm. That was what I expected out of this one and was the exact opposite of what I ended up experiencing. The sound off of the face of this design was instead much lower and resonating than I have experienced off of most stainless heads before and this is what leads to a “softer” feel than expected. I give credit to design of the cavity in combination with the top line of the putter for this lower and more plush feel. It is very impressive to me to have a stainless putter feel (sound) so soft. 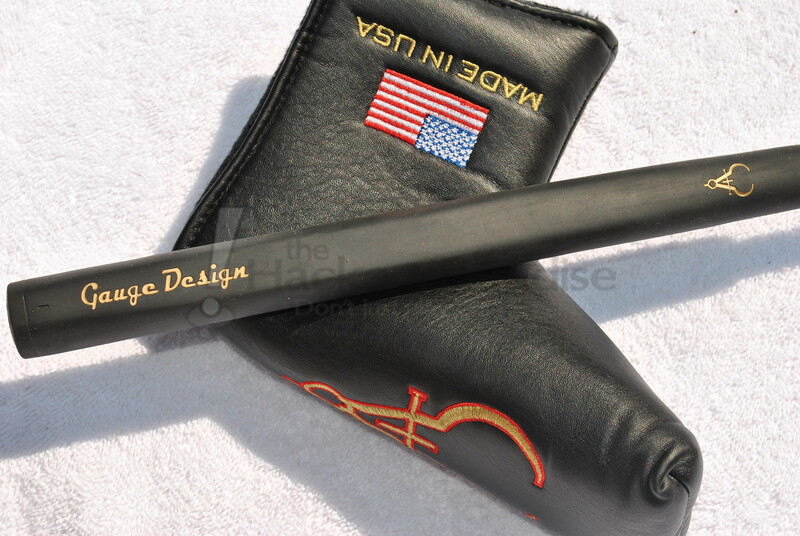 Most boutique putter companies also do true custom work and Whitlam/Gauge is no different. In addition to reviewing the “Little Dog”, I was given the opportunity to get my hands on an example of what Whitlam/Gauge could do in the custom department that they refer to as “The Lab”. The example I saw was in the form of Whitlam’s take on a truly immortal putter design, the 8802. To me this head style is arguably the most classic shape of all time. I will admit to being a sucker for an 8802 design, so I was thrilled to get this one in my hands. Even more to the point of what they can do in “The Lab”, this 8802 is a limited edition of this head shape for them. Though it is a very simple design, it is also a design that is very hard to get right. Whitlam really toed the line with classic on this one. The look from above is very classic, but not without a subtle twist. For overall balance, Whitlam/Gauge added a nice two-planed bevel on the sole of the blade. Through the stroke this one truly felt heavier than the average 8802 design, so out of curiosity I pulled the head to weigh it. It surprised me by coming in right about 330g. I honestly have to give credit to the balance and distribution of weight in the design for the feel of heft. The putter was given a very classic piano black PVD finish and a simple Whitlam logo on the heel that was filled with sliver and red and really showcases the finish. It puts a pure roll on the ball and is simple, clean, and very well done. This is truly a prime example to me of what a custom department should be about. It may be a basic design, but the care put into it is beyond impressive to me. The boutique putter field has become a crowded one over the past few years. It requires a company to toe the line of production as well as custom work. In all honesty, Whitlam/Gauge seems to have done it in a very unique way that is all their own. Not only are they willing to take on true customs like the 8802, but they also navigate offering a plethora of different designs by utilizing the both Whitlam and Gauge. Both lines certainly bring something different to the table and although some of it is admittedly a bit too far out there for my personal eye, the “Little Dog” and the 8802 just prove to me that there is a something for everyone out there in these lines. Whitlam and Gauge are certainly two brands that not many have heard of, but are definitely worth keeping an eye on. I was very impressed with their desire to not only produce a tremendous quality putter, but also to continue pushing the envelope. Good review Jman! Nice to hear of the plush feel on the little dog. Nice review Jman, I love the look of the Little Dog….wish I had the $$ for one. Great job from top to bottom there, James. I think I’m more a fan of the Whitlam line just because of the simplicity factor. That 8802 is just ridiculous looking. Pretty cool that it’s one of two as well. Great review Jman, I’d probably prefer the 8802 as I tend to lean towards the “simpler” looking putters. But hey, whatever works! Nice job Jman! Those are some solid looking putters and I love the simple look that they have. 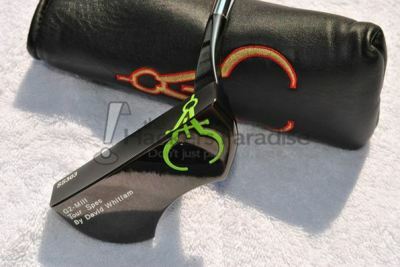 Very nice review of these 2 putters James. Really interesting to hear that the thicker top line actually helped with the overall balance. I have never heard that mentioned but it does make sense given the width on these. I remember seeing these in Iowa and the craftsmanship is up there with the best of them. Great review. I was lucky enough to see these at the Tour Van stop and they are simply gorgeous. nice review. Looks like a quality product, just not sure if it’s for me or not. Great job as always JMan. You sir a putter connoisseur. I love reading your reviews because you have such passion for all putters, not just certain brands. Great review and thoughts James. Beautiful putters although the asymmetrical cutout immediately distracted my eyes. I love the wrapping caliper logo though. Great review Jman. I like the looks of the finish and design a lot. I could easily put that Little Dog in the bag (loved the description of the sound/feel) but I don’t think I’d have much luck with the 8802 but it sure looks gorgeous. Nice work on the review! Definitely spot on with the thicker topline. I love it! A truly fantastic start to your testing here on THP Jman! Well done indeed!! I really like the look of the G2 and love that you were surprised by it for a number of different reasons. Nice review Jman! I love the looks of both of those so if/when I decide to go for a boutique putter, I’ll give this company a look for sure! Great writeup Jman! The little dog is such a unique looking putter, very well done! Great review here James, I had not heard of this company until you were given the chance to mention them and it intrigues me just how hard it must be to become a real player in this segment of equipment. Great looking putters with a flair towards “Classic”, and simplicity, yet an air of technicality built in. Nice job! Good work, dare I say home run? Seriously, this is a fine read. Nice Job JMAN, I really liked the looks of the “Little Dog” It really intrigued me in Iowa. 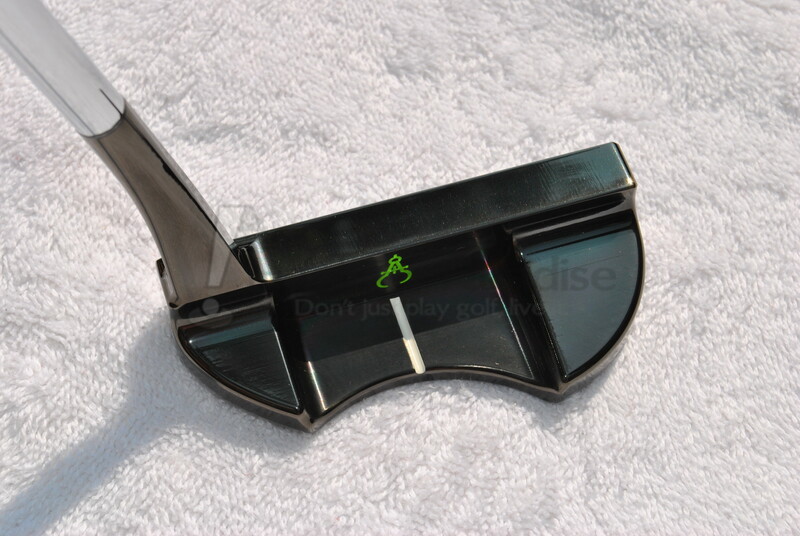 I like you have always struggled with the #9 design but it is definately a good looking putter! Love the review James! The little dog is sure easy on the eyes. Great review. I enjoyed how you captured the Little Dog in a way that, even without pictures, I would have had a great representation in my mind about the design. Nice job Jman, love the love the look of the Little Dog. Well done as always Jman, I am liking that double bevel on the 8802. Great review James! The 8802 is a classic, and that Little Dog is just gorgeous. Great review man! Those are some gorgeous looking putters!! Great review JMan. Always enjoy reading your work. That 8802 sure is pretty in a basic, but very well finished way. Simplistic yet beautiful! Well done James. Love the different looks of traditional and something new. I enjoyed reading your review James. The # 9 looks intriguing to my eye and could def. find a spot in my bag. And the Lab has a simple yet attractive design that looks like a real performer. Definitely a nice looking puter – the Piano Black is downright gorgeous. Great looking putter and a great written review. Well done!